Brain cancer. 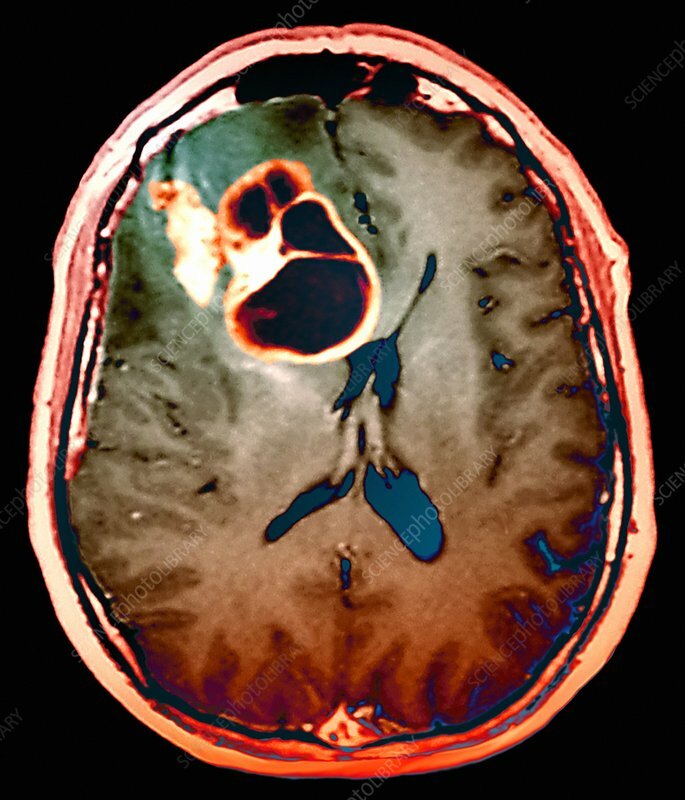 Coloured axial (horizontal) magnetic resonance imaging (MRI) scan through the head of a patient with a glioma (black, upper left). The front of the head is at top in this view from below. The glioma is in the right hemisphere of the brain. This is an oligodendroglioma, a tumour that arises from a type of glial (support) cell of the brain called an oligodendrocyte. This type of cell forms the sheath around axons in the brain and spinal cord. This cancer does not spread, but will damage the brain if not treated by surgery, radiotherapy or anti-cancer drugs. MRI scanning uses powerful magnetic fields and pulses of radio waves to form slice images of the body.